The top representative of Uzbekistan, Rustam Kasimdzhanov is a Grandmaster whose best accomplishment was winning the 2004 FIDE World Championship. On his way to the title he defeated 7 top players including names such as Vasily Ivanchuk, Veselin Topalov and Michael Adams. Once he won the World Championship, he became a household name among chess players. 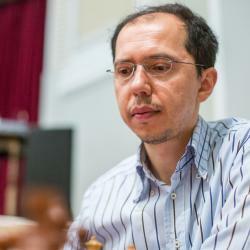 Rustam Kasimdzhanov didn’t start to appear on the high-level chess scene until he was awarded his Grandmaster title in 1997. After this, he began to win many large tournaments including the 1998 Asian Championship, 2001 Essen tournament, 2002 Pamplona tournament and the 2003 Vlissingen Open. His biggest accomplishment came at the FIDE World Chess Championship 2004. It was here that he won mini-matches against 6 different players in order to play against Michael Adams in the final match. Kasimdzhanov tied the match and won the playoff in order to become the new World Champion. He didn’t end up holding on to the World Champion title the following year and lost his crown. Ever since losing the World Championship, he has continued to be a very strong player with up and down results. He has placed badly in tournaments such as 2005 Linares (tied for last place) but won tournaments such as the 2006 Corsica Masters. He still holds onto a 2700+ rating, keeping him within the top 50 players in the world.